In film, image is everything. Give a viewer a wealth of intriguing visuals and they are bound to forgive your occasional miscalculations and missteps. A filmmaker like Terry Gilliam is a perfect example of someone capable of overcoming scripted pitfalls with his own unbridled imagination. The same can be said - to a lesser extent - for Tim Burton and/or Darren Aronofsky (though The Fountain filmmaker is quite capable of producing powerful ideas as well). So when a movie, via its maker, decides to push the boundaries of believability - either in storyline, characterization, time, place, setting, situation, history, histrionics, etc. - it better offer up a feast for the eyes and mind. Frankenstein's Army does just that. Sure, it uses a past its due date directorial gimmick (the found footage format) to earn some distinction, but this is really nothing more than a resume reel for the guys huddled behind the camera lens and those they hired to realize their insane creature imagery. It's the end of World War II and a Russian division is headed into the heart of the German countryside to rescue some comrades and uncover as many Nazi secrets as possible. With a film crew along to 'document' any discoveries, they stumble upon a lab where a weird scientist (Karel Roden) has created a last gasp strategy for the Third Reich. Using Dr. Frankenstein's original notes and ideas, the madman has unleashed an army of zombified, cobbled together solider bits fused with updated mechanical abilities, and these non-human hunter fiends are fierce. It's not long before the Russian soldiers are dropping like flies, there's a betrayal in the ranks, and, with the camera capturing everything, the fate of the world sits in the balance. Frankenstein's Army is an amazing steampunk splatter fest. It's creature designs and F/X are so stunning that you instantly forgive the film its many, myriad faults. There is no strong central core, no hero we root for or cause we're concerned over. The characterization is rooted in cliche and the overall arc is one of "arrive, then die." It's very much a slasher film in style and execution. Still, we enjoy every minute of this otherwise mediocre movie because of the unnecessary POV perspective, and what these Russkies find once they break the secret lab. Indeed, Frankenstein's Army revolves around the various unique monsters on display, make-up and old school physical costuming turning actors and ambition into jaw dropping examples of movie magic. It's action figure time, a surreal combination of Todd McFarlane interpreting Clive Barker. Imagine the Cenobites as pro-Hitler henchmen and you start to get the idea here. Start. Indeed, there is so much visual acumen on display in Frankenstein's Army that you just wish it hadn't bothered with the war material. Indeed, director Richard Raaphorst does such a great job with the mad scientist stuff that we overlook most of the prelude. In fact, there are some decent battle sequences that really shine when you consider the relatively low budget nature of this production. In fact, this film feels like the creative kin to George Romero's brilliant Day of the Dead. Originally conceived as a World War Z like undead epic, the zombie king had to cut down his vision to make accommodate the limited funds he had to work with. It's the same here - the same premise, the same increasingly crazed doc in charge, the undeniably disgusting human vivisection and experimentation sequences, and the ample use of blood and guts. Gorehounds will appreciate the moments when Karel Roden (who you might recall from Rocknrolla or the first Hellboy) shows the Russians around his lab. With various soldiers and prisoners strung up to tear down and reconfigure, it's one arterial spray atrocity after another. It's like out a scene out of a sexless Ilsa: She Wolf of the S.S. As the bloodletting grows more and more intense, we soon realize that Raaphorst doesn't really care about suspense or scares. Instead, as a former special effects supervisor and creator, he wants to showcase what his behind the scenes talent can do. Luckily, they are all so sensational that you'll never notice the inconsistencies and contradictions (that 8mm film sure looks like circa 2012 digital...). Another thing you won't mind is the lack of any real danger or threat. These are some mindless beings, unable to accurately destroy an enemy less they walk into their weaponry or surprise them into submission. As an actual army, they'd be pretty ineffectual for anything other than intimidation. One Allied bombing run and their wonky, salvaged parts personas would be ready for the junk heap. Still, it's a novel idea, albeit one we've seen before (Nazis and zombies seem to go hand in hand ala the horror field) and Raapohorst executes it with undeniable flare. Was there a better way to handle the material outside a Blair Witch riff? Absolutely. Does the found footage element undermine the film wholly? No at all. In fact, one can easily see Frankenstein's Army generating its own cult of curiosity. As a fright flick it more or less fails. But as an example of how to make genuinely creepy monsters in this new, CG heavy age, it's a masterwork. The people in the make-up and costuming trailers, using Face Off like efficiency in turning silicone and spare parts into undeniably successful nightmares, are the real star here. For those of us old enough to remember when bitmaps didn't rule the creature feature domain, such backwards glancing is brilliant. Too bad the rest of the film is not as notable. 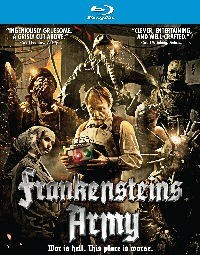 Frankenstein's Army will guarantee a lot of people future positions in Hollywood's hit-making machinery. For a horror geek looking for a good scare, the returns are a bit more limited.